NASHVILLE, Tenn.—Half of Protestant pastors say their colleagues should step down from the pulpit for a time if they are accused of misconduct. Most say such accusations should be kept in confidence until proven. And few think pastors who commit adultery should be permanently banned from ministry. Those are among the findings of a new telephone survey of 1,000 Protestant senior pastors from Nashville-based LifeWay Research. LifeWay Research asked pastors four questions about how to handle allegations of misconduct. They included whether a pastor should step down during a church investigation; when, how, and whether the congregation should be informed about allegations of misconduct; and whether a pastor who commits adultery can return to the pulpit. 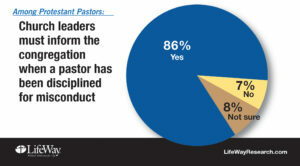 LifeWay Research found disagreement over whether a pastor should step aside when accused of misconduct. Forty-seven percent of those surveyed say a pastor should step aside while church leaders investigate the allegations. About a third (31 percent) say the church should leave the pastor in the pulpit. One in 5 (21 percent) is not sure. Older pastors (those 65 and older) are more likely to want the pastor to stay in the pulpit (36 percent). Younger pastors (those 18 to 44) are less likely to hold that view (27 percent). African-American pastors (50 percent) are more likely to want the pastor to remain in the pulpit than white pastors (30 percent). More Baptists (35 percent) and Pentecostals (43 percent) want the pastor to remain than Methodists (24 percent) or Presbyterian/Reformed pastors (24 percent). Most pastors seem cautious about sharing details of alleged misconduct with the entire congregation. Few (13 percent) say allegations should be shared with all church members. Most (73 percent) say allegations should be kept in confidence by church leaders during an investigation. Fourteen percent are not sure. Pentecostals (85 percent) are more likely to say allegations should be kept in confidence than Methodists (63 percent). Pastors are more comfortable sharing details with the congregation if a pastor has been disciplined for misconduct. Most (86 percent) say it is essential for church leaders to let the congregation know in such cases. Stetzer said pastors and churches alike struggle with how much detail to share with the congregation, especially about alleged misconduct. “We don’t have a lot of models of how to have transparent conversations,” he said. Churches and pastors also need to be aware of legal concerns. A false allegation could lead to a lawsuit for slander—especially if the pastor denies the allegations, said Frank Sommerville, a Houston-based attorney who specializes in legal issues facing churches. That investigation should go quickly. Sommerville suggests churches have a process in place in case there are allegations of misconduct. That includes taking possession of the pastor’s work email, cell phone and computer. The process should take about 10 days, and Sommerville suggests the pastor step down with pay during the process. He suggested church leaders—the church board, presbytery, council, or other leadership group—keep the allegations confidential until the investigation is over. After a decision is made, they can inform the congregation about some of the details. Pastors are split over how long a preacher should step down from public ministry after having an affair. One in 4 (24 percent) supports a permanent withdrawal from public ministry. A similar number (25 percent) is not sure. About a third (31 percent) say a pastor should step down between three months and a year. Older pastors (those over 65) are more likely to want a permanent ban from ministry (28 percent) than pastors age 55-65 (19 percent). Middle-aged pastors (those 45 to 54) are more likely to say from three months to a year is more appropriate (38 percent). African-American pastors (45 percent) are more likely to say a pastor should leave for three months to a year than white pastors (30 percent). The phone survey of Protestant pastors was conducted March 9-24, 2016. The calling list was a stratified random sample, drawn from a list of all Protestant churches. Quotas were used for church size and Black Protestant denominations. Each interview was conducted with the senior pastor, minister or priest of the church called. Responses were weighted by region to more accurately reflect the population. The completed sample is 1,000 surveys. The sample provides 95 percent confidence that the sampling error does not exceed plus or minus 3.2 percent. Margins of error are higher in sub-groups.